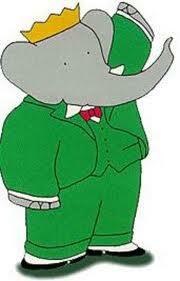 Babar is another great character when it comes to books and shows. My mom would read us Babar books and once we went to a local bookstore to meet Babar. My Mom has the cutest picture of my little brother sitting with Babar. If you do not know who he is, he is the Elephant King of Celesteville. He has a wife and children and they have many exciting adventures together. When I had the chance to host a giveaway for a great Babar Christmas movie I was excited to be able to share Babar with everyone. Babar and Father Christmas is the story of when Father Christmas does not bring toys to the elephant children of Celesteville and King Babar sets out to find him. You can purchase Babar and Father Christmas on DVD online at Barnes and Noble. Have you heard of Babar the King of Celesteville? If so do you have a favorite book or movie? I have. I actually have the Best Friends Forever DVD. My daughter loves it! I love the back to school movie. We love Babar, especially my 7 year old! i have heard of barbar. I dont have a favorite book that I remember, but this was popular when i was a kid!